Malt Extract (Paines, Edme or Diamalt) 3 added to the mash tun during mashing. No. 3 Invert (Manbre, Albion or Clark) 2.5 added to the copper. I used to drink Courage Tavern in the Queen's Head in Newark... 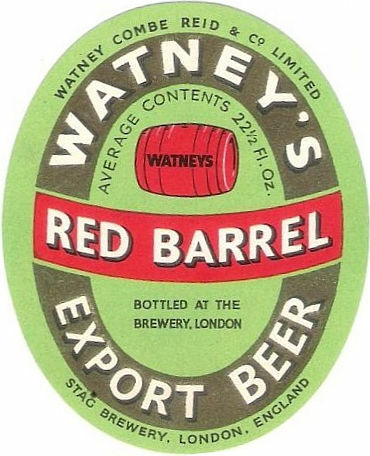 I think Watney's Red Barrel went really v]crap when it was reformulated (I think I've got that right) and renamed "Watney's Red". Funnily enough Ron, I have been thinking about this beer over the past couple of days, despite the fact I have never tried it or seen it for sale. While I was engrossed in a Eddy Merckx documentary I got for Xmas, I noticed that Watney's Red Barrel was emblazoned on a (official sponsor) banner stretched over the course near the finish on one of the TdF stages in either 1969 or 1970. I seem to remember an article saying there was a push into Northern Europe around this time by English brewers with Le Rostbif pub(?) in Paris etc. But seeing it in a TdF stage was quite a jolt. A friend of mine loves craft beer. I might brew this for his birthday. This report from Bailey and Boak some time back indicates that Watney`s Red (vs. Red Barrel) had 20% sugar and used roasted barley vs. coloured malt. They also suggest that by the time Red was introduced, Red Barrel itself had dropped in malt content a fair bit, to 77% or some 12%, in favour of sugar. From this, and your own report, it`s fair to conclude that the beer CAMRA reacted to was the result of an incremental process. The all-malt Red Barrel would not have aroused the ire that Red did, IMO. It was clearly a decent replication of what was originally a pale ale and of course was not the only keg bitter in the market. Due to the processing of any keg product, it would likely never have gotten the love from CAMRA but that some bad press rubbed off on even the original Watney Red Barrel keg is undeniable and perhaps inevitable because of what Red was. This is what happens when recipes change over time and malt and hop character become de-emphasized. Eg. the Red recipe specified no late-addition hops and I`d guess - maybe you know, Ron - the original RB had such addition. But either way, Red represented the terminal point of an evolution which was the result of specific brewing and corporate decisions - it didn`t have to be that way, but it was. I correct: the original Red Barrel keg was not 100% malt, but at some 95% malt, to all intents and purposes, it was.